The current Lawn Fawnatics challenge is to use the emboss resist technique. I "resisted" the urge to make a seasonal snowy scene and instead, went with a star themed design. My stars are from Lawn Fawn's Starry Backdrops stamp set. I stamped the star background image in white pigment ink on a white panel, then heat embossed the stars in white. I used ink applicators to apply a rainbow array of distress inks across the embossed panel, then wiped away the ink over the embossing to make the stars pop. The rainbow panel was adhered to a card base. To go with the rainbow, I covered the rest of the card base with pale blue cardstock panels. Each panel was edged with a narrow strip of silver cardstock, then adhered with foam tape. 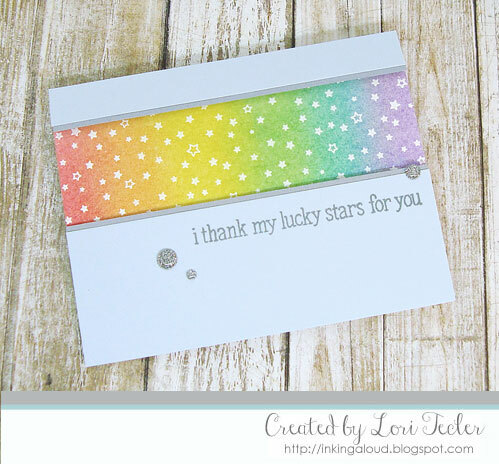 I stamped the "I thank my lucky stars for you" sentiment from the Starry Skies set beneath the star panel in gray ink. The words were accented with a trio of silver glitter enamel dots. This wonderful card makes me smile! I love the fun rainbow colors! So happy you joined us at Lawn Fawnatics! I love your rainbow starry card :) Thank you for playing along with us in the Lawn Fawnatics challenge!